We describe methods to isolate canine neutrophils from whole blood and visualize NET formation in live neutrophils using fluorescence microscopy. Also described are protocols to quantify NET formation and citrullinated histone H3 (citH3) expression using immunofluorescence microscopy. 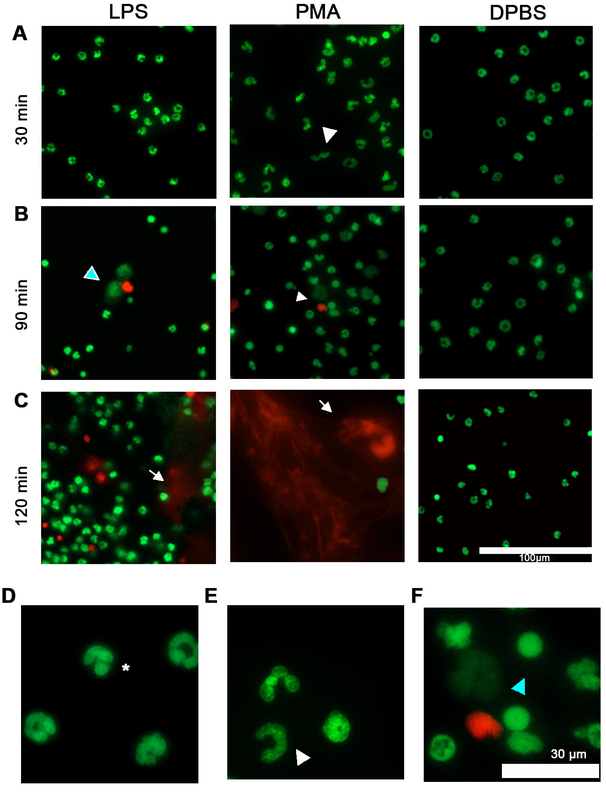 Li, R. H., Tablin, F. In Vitro Canine Neutrophil Extracellular Trap Formation: Dynamic and Quantitative Analysis by Fluorescence Microscopy. J. Vis. Exp. (138), e58083, doi:10.3791/58083 (2018). In response to invading pathogens, neutrophils release neutrophil extracellular traps (NETs), which are extracellular networks of DNA decorated with histones and antimicrobial proteins. Excessive NET formation (NETosis) and citH3 release during sepsis is associated with multiple organ dysfunction and mortality in mice and humans but its implications in dogs are unknown. Herein, we describe a technique to isolate canine neutrophils from whole blood for observation and quantification of NETosis. Leukocyte-rich plasma, generated by dextran sedimentation, is separated by commercially available density gradient separation media and granulocytes collected for cell count and viability testing. To observe real-time NETosis in live neutrophils, cell permeant and cell impermeant fluorescent nucleic acid stains are added to neutrophils activated either by lipopolysaccharide (LPS) or phorbol 12-myristate 13-acetate (PMA). Changes in nuclear morphology and NET formation are observed over time by fluorescence microscopy. In vitro NETosis is further characterized by co-colocalization of cell-free DNA (cfDNA), myeloperoxidase (MPO) and citrullinated histone H3 (citH3) using a modified double-immunolabelling protocol. To objectively quantify NET formation and citH3 expression using fluorescence microscopy, NETs and citH3-positive cells are quantified in a blinded manner using available software. This technique is a specific assay to evaluate the in vitro capacity of canine neutrophils to undergo NETosis. Neutrophils are short-lived granulocytes responsible for the initial defense against invading pathogens. Neutrophils, recruited to the site of infection, eliminate microorganisms by phagocytosis, degranulation, and generation of reactive oxygen species (ROS)1. In the presence of bacteria or endotoxins, neutrophils release neutrophil extracellular traps (NETs), composed of extracellular chromatin decorated with histones and granular proteins like elastase and myeloperoxidase (MPO)2. Although NETs have indispensable antimicrobial properties, increasing experimental and clinical evidence suggests that overzealous NET formation during sepsis may lead to multiple organ dysfunction and death3,4,5,6. Because NETs may play a similar pathophysiological role in dogs, therapeutic interventions that either prevent or diminish NET formation may serve as novel treatment strategies in septic animals. For this reason, there is a need for a reliable technique to assess and quantify NETosis and NET components in dogs. NET components including cell-free DNA (cfDNA) and nucleosomes have previously been evaluated in canine neutrophils and plasma from clinical dogs7,8,9. Using fluorescence assays, Goggs and Letendre found that septic dogs have higher levels of cfDNA than healthy dogs8. Although these techniques are highly objective and quantitative, measurement of cfDNA and nucleosomes as markers of NETosis is non-specific since they can be derived from necrotic cells other than NETosing neutrophils. Here we describe a technique that utilizes fluorescence microscopy to examine the behaviours of live NETosing neutrophils. We also detail a modified protocol using double-immunolabeling to subjectively quantify NETs and their components such as MPO and citH3 in canine neutrophils10. All methods described here were approved by the Institutional Animal Care and Use Committee at the University of California, Davis (protocol number: 18338). Draw 10 mL of blood from either the cephalic or jugular vein using a 21 G needle by syringe aspiration. To avoid excessive shear stress, remove the needle from the syringe before transferring blood into tube(s) containing sodium heparin (75 USP). Gently invert the tubes a few times to ensure adequate mixing of anticoagulant and blood. Check for evidence of clots or red cell aggregates before placing the samples on ice. Dilute anticoagulated blood with an equal volume of ice-cold Dubecco’s phosphate-buffered saline (DPBS) (pH 7.4, without divalent cations). Transfer 8 mL of diluted blood into a 50 mL polypropylene conical tube containing 25 mL of 3% dextran (From Leuconostoc spp. dissolved in 0.9% sodium chloride solution). Place the tube upright in room temperature for 30 min to allow aggregation and sedimentation of erythrocytes. Carefully layer 5 mL of leukocyte-rich plasma (Figure 1) on top of 5 mL of density gradient media in a 14 mL polypropylene round-bottom tube. Be careful not to mix the 2 solutions11. Centrifuge the tubes at 400 x g with acceleration/deceleration (A/D) set to 0 (no brake) for 30 min at room temperature. 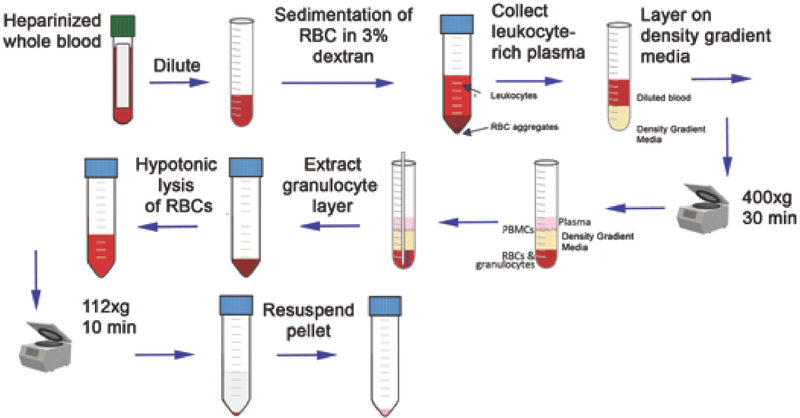 Using a 5 mL serological pipet collect the granulocyte cell layer by bypassing the plasma and peripheral blood mononuclear cell (PBMC) layers (Figure 1). Use a new pipet each time to minimize contamination. Place 4 to 6 mL of the polymorphnuclear (PMN) cell layer in a 50 mL polypropylene conical tube. Since a small amount of erythrocyte aggregates may be aspirated along with the PMN layer, use a 1 mL serological pipet to gently remove the erythrocyte aggregates that are settled at the bottom of the tube. Lyse the remaining erythrocytes with 20 mL of cold ultrapure water. Gently invert the tube multiple times for 30 to 60 s to ensure adequate lysing before adding an equal volume of ice-cold 1.8% sodium chloride solution. Centrifuge at 112 x g for 10 min at 4 °C, A/D set to 0. Repeat the erythrocyte lysis step if this pellet appears red. Discard the supernatant carefully with a serological pipet and gently resuspend the pellet in 100 µL of DPBS (5 mM dextrose, 0.9 mM MgCl2, 1.9 mM CaCl2 and 1% bovine serum albumin, pH 7.3). Combine all resuspended cells and place on ice. Perform a cell count using an automated cell analyzer and verify the count by a hemocytometer. If necessary, concentrate PMNs onto a glass slide using a cytocentrifuge (1,000 rpm, 5 min) and determine the percentage of neutrophils by counting the number of neutrophils out of the total number of cells. Determine the viability of the neutrophils by performing a trypan blue exclusion test as outlined by Strober et al.12 Successful isolation should yield a viability from 95 to 100% and neutrophils should be greater than 95%. Determine the concentration of neutrophils by multiplying the total cell count with the percent viability and percent neutrophils. Successful isolation should yield a concentration of neutrophils from 1.5 to 6 x 106/mL. Dilute neutrophils to a final concentration of 1 x 106/mL with DPBS containing 5 mM dextrose, 0.9 mM MgCl2, 1.9 mM CaCl2, and 1% bovine serum albumin with pH adjusted to 7.3. Place 200 to 400 μL of neutrophils (1 x 106/mL) into each well of a poly-L-lysine coated 12-well culture plate. Allow neutrophils to adhere to the bottom of the wells by incubating the cells at 37 °C for 30 min. Label nucleic acids with 1 μM of one of two nucleic acid dyes, one that stains in cells with intact membranes and one that stains in cells with permeable membranes (see Table of Materials), for 10 min at room temperature. Activate neutrophils with 100 μg/mL lipopolysaccharide (LPS) (E. coli O55.B5), 100 nM phorbol 12-myristate 13-acetate (PMA) as positive control, or equivalent volume of DPBS as negative control for 180 min at 37 °C. Acquire images using the GFP (Excitation: 470/22 nm, Emission: 525/50 nm) and Texas Red channels (Excitation: 585/29 nm, Emission: 628/32 nm) on a fluorescence microscopy at 40X magnification at the following time points: 30, 90, 120, and 180 min. Carefully place 18 mm diameter Poly-D-lysine coated cover slips into the wells of a 12-well culture plate. Label the wells appropriately. Seed 100 to 200 μL of isolated neutrophils (1 x 106/mL) directly onto the coverslips and allow neutrophils to adhere to the cover slips by incubating the cells at 37 °C for 30 min. Activate neutrophils as described in 3.3. Inhibit NET formation by pretreating neutrophils with 200 µΜ Cl-amidine (15 min, 37 °C) prior to activation as previously described by Li et al.13 Ensure that the proper vehicle control (DMSO) is included in the experiment. Carefully remove cover slips with fine forceps. Layer a paraffin film sheet over a test tube stand to create shallow wells and place 2 to 3 drops of 4% PFA in each well10. Label the wells appropriately and gently lay the cover slips upside down onto the PFA-filled wells. Allow cells to be fixed at room temperature for 20 min. Wash the cells 3 times in DPBS for 5 min, by moving them from one well to the next. If immunolabelling cannot be performed shortly after neutrophil activation and fixation, allow cover slips to be air dried by placing the cover slips face-up on a piece of absorbance paper. Cover slips can be stored for up to 1 week face-up in a labelled 12-well culture plate at 4 °C until further analysis. Wash the cells 3 times in DPBS for 1 min using the same technique as described in 4.4 before proceeding to the next step. To permeabilize cells, gently lay the cover slip upside down on a drop of 1% NP-40 for 1 min using the technique described in 4.4. Wash 3 times in DPBS for 1 min on a rocker. Randomly assign each sample to a number and use a diamond point marker to label the coverslips accordingly. Prepare and label individual Petri dishes lined with paraffin film and place 100 to 200 μL of 5% goat serum onto the film (blocking buffer). Lay the coverslips upside down on the blocking buffer. Place on a rocker and incubate for 1 h at 37 °C. Wash 3 times in DPBS for 5 min on a rocker. Dilute the primary antibody (1:400 rabbit polyclonal anti-citrullinated histone H3 (citH3) in 5% goat serum). Incubate cells in labeled Petri dishes lined with paraffin film. Lay each cover slip upside down on 50 to 100 μL of the diluted antibody solution. Place on a rocker and incubate for 1 h at 37°C. Dilute secondary antibody conjugated to a fluorophore (1:200) in 5% goat serum. Incubate cells in labeled Petri dishes lined with paraffin film. Lay each cover slip upside down on 50 to 100 μL of the diluted antibody solution. Place on a rocker and incubate 1 h at 37 °C in the dark. Wash 3 times in DPBS for 5 min on a rocker in the dark. Incubate cells in labeled Petri dishes lined with paraffin film. Lay each cover slip upside down on 100 to 200 μL of 10% rabbit serum under gentle rocking (overnight, 4 °C, in the dark). Incubate cells in 50 μg/mL unconjugated goat anti-rabbit Fab fragments for 2 h at room temperature on a rocker in the dark. Dilute primary antibody (1:200 rabbit polyclonal anti-human MPO antibody) in 5% goat serum. Incubate cells in labeled Petri dishes lined with paraffin film. Lay each cover slip upside down on 50 to 100 μL of the diluted antibody solution. Place on a rocker and incubate 1 h at 37°C in the dark. Interference controls should be prepared by excluding incubation with either primary antibodies in the second immune-labelling step. Stain DNA with 300 nM of 4’,6-Diamidion-2-Phenylindole, Dihydrochloride (DAPI) for 5 min in the dark at room temperature. Wash 3 times in DPBS for 1 min on a rocker in the dark. Apply a drop (~50 μl) of antifade mountant onto a glass slide. Gently tap the edge of the coverslip on an absorbent paper to remove excess buffer before mounting the coverslip with the cells upside down. The mounting medium should form a thin layer between the coverslip and the glass slide. To remove air bubbles, very gently press on the coverslip with fine forceps. Allow samples to cure overnight in the dark at 4 °C. The mounting medium should harden for microscopic analysis with immersion lenses. Store samples in 4 °C in the dark. Blind the operator(s) acquiring and analyzing the microscope images to the experimental conditions. Using a fluorescence microscope at 40X magnification, take 10 images randomly from different regions of each coverslip in an experiment under the respective channels. Ensure that the exposure time, brightness and contrast of each channel are kept consistent throughout the acquisition of images. Analyze the images using available software such as ImageJ (NIH). Identify NETs based on co-localization of cfDNA, citH3 and MPO (Figure 3A, B). Quantify the number of NETs and neutrophils in 10 random fields for each experimental condition. Numbers of NETs released can be expressed as a ratio (number of NETs: total number of neutrophils) for each experimental condition. To evaluate the treatment effects on intracellular citH3 expression, count the number of neutrophils with intracellular citH3 and number of neutrophils without intracellular citH3 in 10 random fields at 40X magnification under the respective channels (Figure 3, red arrows). Intracellular citH3 expression can be expressed as the ratio of number of neutrophils with intracellular citH3 to the number of neutrophils without intracellular citH3. 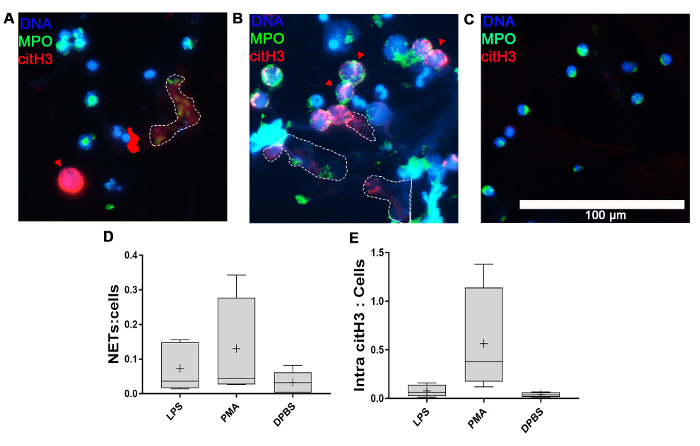 Using this protocol of live cell imaging, investigators can observe the nuclear morphology, plasma membrane integrity and presence of cfDNA in living neutrophils. A cell impermeant nuclear dye stains nuclei acids red in cells with damaged cell membranes. Another cell-permeant dye, labels intracellular nucleic acids in live cells with intact plasma membranes. All intact neutrophils, regardless of their treatments, should appear green and exhibit the characteristic lobulated nuclei at 0 to 30 min after stimulation (Figure 2A). Nuclei of PMA-treated neutrophils begin to lose their lobulated appearance by around 60 min and continue to decondense until the release of cfDNA (Figure 2B). LPS, a slower and more physiologic stimulant of canine neutrophils, typically does not result in chromatin decondensation or NETosis until 90 min after stimulation (Figure 2B). By 120 min, LPS- and PMA-activated neutrophils can be seen surrounded by cfDNA. Compared to LPS, more-PMA activated neutrophils lose their plasma membrane integrity as they are stained red by the cell impermeant dye (Figure 2C). Unstimulated neutrophils (DPBS control) should maintain lobulated nuclei and intact plasma membrane throughout the incubation period (Figure 2A-C). NET components consisting of cfDNA, citH3 and MPO granules are detected using the double immunolabeling protocol. Release of NETs, identified based on co-localization of cfDNA, citH3 and MPO, in response to LPS and PMA are shown in Figure 3A and 3B, respectively. Neutrophils stimulated by LPS for 180 min produce discrete web-like scaffolds of NETs in close proximity to nearby neutrophils (Figure 3A). In contrast, PMA-activated neutrophils produced vast amounts of NETs that were noticeably larger in area (Figure 3B, D). Citrullination of histones H3, catalyzed by the enzyme peptidylarginine deiminase (PAD), is a hallmark of NETosis. PMA, a potent stimulant of PAD, results in a higher number of cells expressing intracellular citH3 compared to unstimulated and LPS-stimulated neutrophils (Figure 3E). Figure 1: A schematic diagram demonstrating the steps of canine neutrophil isolation. Diluted heparinized whole blood is first mixed with 3% dextran for sedimentation of red blood cells (RBC). Leukocyte-rich plasma is then collected and layered onto equal volumes of commercially available density gradient separation media. Following centrifugation (400 x g, 30 min), the RBC-granulocyte layer is extracted and the remaining RBCs are removed by hypotonic lysis. After addition of 1.8% NaCl, granulocytes are spun down (112 x g, 5 min) and resuspended in dedicated buffer. Please click here to view a larger version of this figure. Figure 2: Representative fluorescent images of live canine neutrophils. Isolated neutrophils were activated with 100 µg/mL LPS, 100 nM PMA, or equivalent volume of Dubecco's phosphate-buffered saline (DPBS) as negative control for a total of 180 min. Nucleic acids in live intact neutrophils were stained green with using a cell-permeant dye while cfDNA and neutrophils with compromised cell membranes were stained red with a cell-impermeant dye. (A, D) DPBS- and LPS-treated neutrophils all maintained an intact cell membrane with lobulated nuclei (asterisk). (A, E) The nuclei of PMA-activated neutrophils began to undergo decondensation (arrowheads). (B, F) By 90 min, most nuclei in LPS- or PMA-activated neutrophils had lost their lobulated appearance (Blue arrowheads). (C) After 120 min, all PMA-activated neutrophils had permeable plasma membranes surrounded by cfDNA while cfDNA could be seen surrounding a small number of LPS-activated neutrophils (arrows). Unstimulated neutrophils did not produce cfDNA nor had compromised cell membrane at any time point (A-C). (A-B) Original 40X magnification. Scale bar = 100 µm. (D-F) 80X magnification. Scale bar = 30 µm. Experiment was replicated twice from neutrophils isolated from 3 different donors. Please click here to view a larger version of this figure. Figure 3: NET formation. (A-C) Representative immunofluorescent images of in vitro NET formation. Isolated neutrophils from a single donor were fixed, permeabilized and stained for DNA (blue), myeloperoxidase (MPO, green) and citrullinated histone H3 (citH3, red) after stimulation with (A) 100 µg/mL LPS, (B) 100 nM PMA or (C) DPBS for 180 min. NETs, identified by co-localization of cfDNA, MPO and citH3, are outlined (dotted lines) on (A) LPS- and (B) PMA-activated neutrophils. Examples of intracellular expression of citH3 are indicated by red arrows. (C) No NETs nor intracellular citH3 are seen in unstimulated neutrophils. Scale bar = 100 µm. (D, E) Representative box and whisker plots of NET formation and intracellular citH3 expression in neutrophils isolated from 4 dogs. The box extends from the 25th to 75th percentiles and whiskers span from the smallest to the largest value. LPS and PMA stimulation resulted in significant (D) NET formation and (E) intracellular citH3 expression compared to unstimulated neutrophils. + represents mean. Please click here to view a larger version of this figure. We present here a protocol to observe the changes in nuclei conformation and cfDNA release in living canine neutrophils using both a cell permeant dye and a cell impermeant dye. The main advantage of this assay is that it allows for real-time detection of NET formation by high-resolution microscopy in live neutrophils without cell fixation, therefore, providing a simple and valuable tool for observing in vitro NET formation. Since this assay does not require antibodies for the detection of NET components, it is ideal for studying NETosis in species with limited availability of species-specific antibodies. Using this assay, the authors demonstrated that canine neutrophils undergo chromatin decondensation under LPS or PMA stimulation prior to NETosis13. A major drawback of this technique is that it is not specific for NETosis. Because the cell impermeant dye also stains nucleic acids in necrotic cells or nucleic acids released from lysed neutrophils, cfDNA or cell impermeant-positive cells could be falsely interpreted as NETs or NETosing neutrophils. Alternatively, the specificity of NETosis can be increased by including PMA- or LPS-activated neutrophils that are pretreated with the PAD4-inhibitor, Cl-amidine. We demonstrated here the importance of ensuring sterility and proper handling of neutrophils throughout the isolation process as contamination and sheer forces can lead to in vitro necrosis and cell lysis. We also recommend complying with the adequate temperatures throughout the protocols and preventing prolonged (>1 min) hypotonic lysis. To confirm the viability of isolated neutrophils overtime, a Trypan Blue exclusion test as well as a negative control consisting of unstimulated neutrophils are highly recommended. Because cfDNA detected by cell-impermeable nucleic acid dyes is not specific for NETosis, we developed a double-immunolabeling protocol for quantifying in vitro NET formation and intracellular citH3 expression in canine neutrophils. As neutrophils release granular proteins like MPO along with cfDNA and citH3 into the extracellular space, NET quantification based on co-localization of cfDNA, citH3 and MPO is more specific compared to other assays such as cfDNA, nucleosomes or DNA-MPO complex14. Due to the limited availability of antibodies that cross-react with canine proteins, we used primary antibodies that originate from another species (rabbit). To prevent capturing of primary antibodies by residual free binding sites on secondary antibodies in either step of the staining process, we first utilized rabbit serum followed by unconjugated Fab fragments to saturate the free binding sites. One critical step of this procedure is to ensure adequate washing to prevent excess binding of immunoglobulins and Fab fragments which may interfere with detection of the second protein of interest. We also recommend testing different dilutions of primary and secondary antibodies to minimize nonspecific binding and interferences. To ensure that the secondary antibodies from either immunolabelling step binds specifically to its primary antibody, investigators should include 2 different controls that exclude either primary antibody in the second immunolabelling step. Non-specific binding occurs when signals from both secondary antibodies are detected. Histone citrullination or deamination, catalyzed by the enzyme peptidylarginine deminase 4 (PAD4), is essential in bacteria-associated NETosis in mice and humans15,16. Using this assay, we were able to determine that LPS-induced NETosis in dogs also requires histone H3 citrullination by PAD13. To test whether the stimulant of interest induces NETosis by PAD4 activation, we recommend the inclusion of positive controls using known PAD4 activators like PMA or the calcium ionophore, A2318717. If neutrophils show negative staining for citH3 in the positive control samples, the protocol must be revised until a sufficient positive staining is resulted. We also recommend the inclusion of biological negative controls consisting of either unstimulated neutrophils or neutrophils treated with the PAD inhibitor, Cl-amidine. Accurate identification of distinct NETs structure can be challenging using this technique. This can be particularly difficult in samples with extensive NETosis, as the merging of NET structures released from multiple adjacent neutrophils can lead to the underestimation of NETotic events. Results of this assay may be correlated with other more objective assays like flow cytometry or ELISA, which have not yet been validated for use in canine neutrophils. To avoid formation of confluent NET structure, investigators can seed a lower concentration of cells. Alternatively, decreasing the total incubation time can avoid extensive NETosis and merging of NET structures. Although this protocol can be used to investigate NETosis in other species, based on the authors' experience, neutrophil response to LPS or PMA can vary greatly among species. The discovery of NETs in dogs highlights that NETosis is a conserved mechanism of innate immunity during microbial infection and immune-mediated disease. The assays presented here can be a valuable tool for the study of NETosis in dogs and other species. A better understanding of sepsis-induced NETosis will facilitate further research into the development of novel treatment strategies for sepsis. The corresponding author was funded by the Morris Animal Foundation (D15CA-907). The study was supported by funds from the University of California, Davis, Center for Equine Health and Center for Companion Animal Health (2016-24-F). The authors would like to acknowledge Geena Ng for her assistance with the figures and Nghi Nguyen for her assistance with the video. Nathan, C. Neutrophils and immunity: challenges and opportunities. Nature Reviews Immunology. 6, (3), 173-182 (2006). Brinkmann, V., Zychlinsky, A. Beneficial suicide: why neutrophils die, to make NETs. Nature Reviews Microbiology. 5, (8), 577-582 (2007). Kaplan, M. J., Radic, M. Neutrophil extracellular traps: Double-edged swords of innate immunity. The Journal of Immunology. 189, (6), 2689-2695 (2012). Czaikoski, P. G., et al. Neutrophil Extracellular Traps Induce Organ Damage during Experimental and Clinical Sepsis. PLoS One. 11, (2), e0148142 (2016). Dwivedi, D. J., et al. Prognostic utility and characterization of cell-free DNA in patients with severe sepsis. Critical Care. 16, (4), R151 (2012). Mai, S. H., et al. Delayed but not Early Treatment with DNase Reduces Organ Damage and Improves Outcome in a Murine Model of Sepsis. Shock. 44, (2), 166-172 (2015). Jeffery, U., et al. Dogs cast NETs too: Canine neutrophil extracellular traps in health and immune-mediated hemolytic anemia. Veterinary Immunology and Immunopathology. 168, (3-4), 262-268 (2015). Letendre, J. A., Goggs, R. Measurement of plasma cell-free DNA concentrations in dogs with sepsis, trauma, and neoplasia. Journal of Veterinary Emergency and Critical Care. 27, (3), 307-314 (2017). Jeffery, U., Gray, R. D., LeVine, D. N. A Simple Fluorescence Assay for Quantification of Canine Neutrophil Extracellular Trap Release. J Vis Exp. (117), (2016). Brinkmann, V., Laube, B., Abu Abed, U., Goosmann, C., Zychlinsky, A. Neutrophil extracellular traps: how to generate and visualize them. Journal of Visualized Experiments. (36), (2010). Oh, H., Siano, B., Diamond, S. Neutrophil isolation protocol. Journal of Visualized Experiments. (17), (2008). Strober, W. Trypan Blue Exclusion Test of Cell Viability. Current Protocols in Immunology. 111, (2015). Li, R. H. L., Ng, G., Tablin, F. Lipopolysaccharide-induced neutrophil extracellular trap formation in canine neutrophils is dependent on histone H3 citrullination by peptidylarginine deiminase. Veterinary Immunology and Immunopathology. 193, 29-37 (2017). Masuda, S., et al. NETosis markers: Quest for specific, objective, and quantitative markers. Clinica Chimica Acta. 459, 89-93 (2016). Li, P., et al. PAD4 is essential for antibacterial innate immunity mediated by neutrophil extracellular traps. Journal of Experimental Medicine. 207, (9), 1853-1862 (2010). Leshner, M., et al. PAD4 mediated histone hypercitrullination induces heterochromatin decondensation and chromatin unfolding to form neutrophil extracellular trap-like structures. Frontiers in Immunology. 3, 307 (2012). Luo, Y., et al. Inhibitors and inactivators of protein arginine deiminase 4: functional and structural characterization. Biochemistry. 45, (39), 11727-11736 (2006).